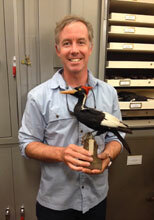 Brian joined the School of Environmental Studies as an Assistant Professor in July 2009. Broadly trained as a community ecologist and conservation biologist, his research examines biodiversity structure and dynamics, and seeks to link theory and empirical approaches. Recently, much of his work has taken place at treeline and in the alpine zone beyond it, in Labrador, British Columbia, and the southwest Yukon. Other recent projects involve examining facilitation among species in bromeliad food webs in Costa Rica. Brian doesn't have an organismal bias to his research, and is comfortable working across the taxonomic spectrum, from insects to plants to birds. For more information, see his Expertise Database profile. In this video, Dr. Brain Starzomski discusses his research into biodiversity in BC and the challenges BC species face in light of climate change.